Jack and Alyssa work out the kinks of their reunion while Baron Samedi's influence continues to grow in New Orleans. It's a colossal multidimensional showdown full of magic and bad blood. Jack and Alyssa have their hands full as they try to help the people of New Orleans fight the influence of the voodoo deity Baron Samedi. It's no easy task as other forces are on the hunt for the Shadowman too. Issue two raises the stakes and ups the action in this involving adventure. Most striking about 'Shadowman' is the relationship between Jack and Alyssa. There's this wedge between them that's palpable as Alyssa remains focused on lifting any and all curses held over the people in town. She's all business with Jack. I wouldn't call it resentment but there is a residual effect from him being gone so long in the Deadside leaving her alone with the burden of protecting the city. She isn't sure she can count on Jack to have her back and it weighs on her mind. Nonetheless, the two together make one hell of a team when they must fight against various threats. His super abilities and her magic play off one another in a couple of fight sequences that are cinematically rendered by Stephen Segovia and Ulises Arreola. The choreography and pacing give this chapter a dramatic confrontation worthy of the big screen. It doesn't hurt that it also includes zombies. You can't go wrong with zombies. The series also benefits from Andy Diggle's expertise in writing smart characters in extraordinary circumstances. His work on James Bond comics specifically informs the emphasis on character development first then action. He delves into the mythos of magic and loa to explain the motivation for Jack and Alyssa before thrusting them into another set piece. It all adds up to a much satisfying read when there's this type of attention to detail and respect for the material. 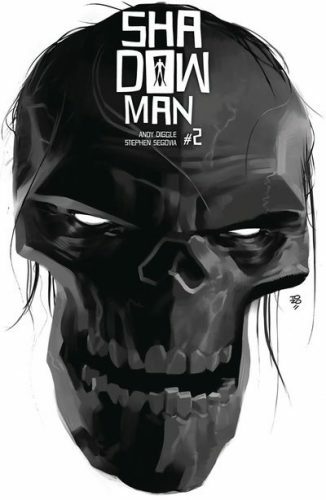 'Shadowman' is Valiant's corner of magic that is every bit as exciting and exhilarating as their other books. It's just as cinematic and awe-inspiring as any movie. Diggle, Segovia, and Arreola conjure up magic of their own with a fast-paced story and heart-racing action. At its heart, is the partnership of Jack and Alyssa that will draw the reader in. The battle for New Orleans continues don't miss it.